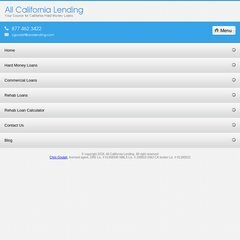 Topics: Commercial Lending, Hard Money Lending, Residential Lending, Rehab Lending, Apartment Financing, and Hard Money Lenders. It is hosted by Ntt America Inc (Colorado, Centennial,) using Microsoft-IIS/6 web server. Its 5 DNS Records include, dns4.name-services.com, dns5.name-services.com, and dns1.name-services.com. The programming language environment is ASP.NET. PING www. (168.143.6.162) 56(84) bytes of data.